Heading the list of international presenters at the March 23-25 Stamford, Conn., conference of the United National Antiwar Coalition (UNAC) is Xiomara Castro de Zelaya, wife of the former president of Honduras, José Manuel Zelaya, who was sent into exile by a U.S. backed military coup. On Feb. 11-12, the founding conference of the Liberation and Re-foundation Party (Libre), a new political party established by the National Front for Popular Resistance of Honduras, chose Castro as its presidential candidate. She speaks at a moment when the U.S. is proposing to double military aid to the current Honduran regime, a regime that they hope will continue to cooperate in the use of this Central American nation as an important U.S. basing and military command center that is deemed important to the facilitation of trade with the Far East. Castro is one of many international activists who are gathering at the UNAC conference to build solidarity in the fight against U.S. and NATO aggression. Others include Kazem Azin of Solidarity Iran; Manijeh Nasrabadi of the Raha Iranian Feminist Collective; Adaner Usmani of the Labor Party of Pakistan; Sergio Fernández, a member of Mesa Amplia Nacional Estudiantil (MANE) and the recent national student strike in Colombia; Gamelyn Oduardo, who helped to organize a 10-month Puerto Rico student strike; and Andrew Murray, a British Trades Union Congress leader of the massive Nov. 30 UK public-sector general strike. Murray will be sharing a panel with Mike Fuqua, a member of the International Longshore and Warehouse Workers Union Local 21, who with the help of the West Coast Occupy movement wrested a contract from the union-busting grain shipper EGT at the port of Longview, Wash. Because the U.S. government planned to use the Coast Guard to militarily ensure the safe docking of a scab ship in the port of Longview, the Action Program that will be the subject of deliberation at the conference calls for the condemnation of the use of the U.S. military at home against unionists. The new militarization of law enforcement in the U.S., and the specific use of related tactics, weapons, and strategies, is another thread that is spurring the participation of a number of other recent victims of repression. Veteran and Oakland occupier Scott Olsen will join leaders of the fight against NYPD wartime spying and harassment of the Muslim American community, such as Imam Talib Abdurrashid of the Islamic Leadership Council of Metropolitan New York, Cyrus McGoldrick of the New York City Council on American Islamic Relations, and Monami Maulik of Desis Rising Up and Moving. All of these international and domestic leaders are coming together to share analysis and solidarity with U.S.-based activists determined to teach the connections between the U.S./NATO war drives, the attacks on civil liberties, and the 1%’s austerity drives. Even more importantly, they are gathering under the umbrella of the United National Antiwar Coalition, a formation that remains committed to mass movement building, to mounting visible opposition in the streets to U.S. imperialism, and retains confidence that this can and will be done in Chicago and beyond. The draft Action Program submitted by UNAC’s National Coordinating Committee is open to full discussion, debate, amendment, and vote at the March 23-25 conference. This is an open, democratic, one-person-one-vote assembly of the broad antiwar and social justice movements. See unacpeace.org to read the draft Action Program and how to submit amendments, alternate plans, and resolutions for consideration by the conference. For more information on the March 23-25 UNAC conference, and to register, go to www.unacpeace.org. 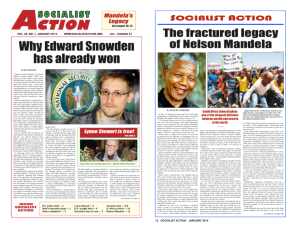 > The article above was written by Christine Marie, and first appeared in the March 2012 print edition of Socialist Action newspaper.